What’s that in my pocket? Despite what people might think, one tends to carry quite some stuff around on a trip around the world. Useful items include for example an ‘iPhone simcard cutter’ and a southern hemisphere compass. That’s a lot of pockets. Again, the answer seems obvious: develop a system for remembering what’s where. In practice this has proven to be challenging. Important things go into the valuables bag, that is stored in the hotel safe. Unless you don’t trust the hotel. Jackets are at the bottom of the backpack (it’s 31 degrees during the day) excepts when the nights cool down to below 10 degrees. Socks are on top of the backpack, but my feet have swollen to much because of the heat so they are no longer useful. Etc. Fortunately, I’ve got more than enough time to think about these things and my stress levels are still manegable, but I fear what will happen to my system once I change climate. 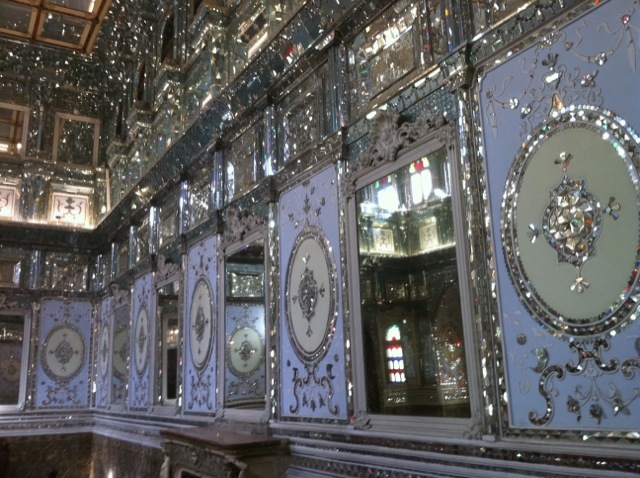 Golestan palace: more is more! Who said that ‘bling’ is a recent trend? The Iranian currency (rial) is collapsing: compared with yesterday the country is almost 3% cheaper. Compared with 2 weeks ago it’s almost 20%. Welcome to the Weimar republic! There’s an interesting twist on the ‘forbidden DELL computers’ story of yesterday. When I discussed this with an Iranian guy he said: “just because we disagree politically, doesn’t mean that DELL can’t make great computers”. Surprisingly Coca Cola seems to agree that you can make profit from an enemy as they even produce their drinks in Iran (and they’re drunk by every irani in this alcohol free country). Visited today the Tehran bazar (which mostly sells wholesale) and the amazing Golestan palace. Will fly to Shiraz tomorrow. Also found a ticket to New Delhi for only 160 euro (total cost Amsterdam – India is less than 400 euro!). There’s still enough to see in Tehran for when I come back. After the initial period where everything seemed different from things I knew, Tehran is getting ‘normal’. I just noticed, but Twitter and Facebook are blocked in Iran (I can post via posterous). These are mu first impressions of Tehran after walking around the south part of the city for a couple of hours. First of all the language barrier is bigger than I thought. Yes, one can always quickly find somebody who speaks English, but it does make life a lot more complicated than say in nepal or myamar. Shopping is the most efficient I’ve ever seen as each street is dedicated to a single product: lamps, shoes etc. Needless to say that I haven’t spoken with a single female iranian yet (whereas I’ve spoken with almost a dozen men). The modern girls seem to compete for the ‘largest sunglasses’ award. Traffic is the worst I’ve seen: crossing a road means throwing yourself for a car a hope that he’ll stop or evade. There’s a remarkable absence of bars and restaurants (maybe I’ve been in the wrong place, but I only saw one fruit juice bar until now). Poverty is mostly absent and I’ve seen very few beggars (which surprises me as i’ve stayed mostly in the poor south).